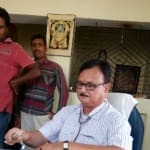 Dr Ashok Mishra is a well known general physician who caters to several families as the family doctor in Allahabad. This doctor has a caring smile and reassuring touch that instantly puts his patients at ease. He couples these qualities very effectively with his large knowledge base while he practices with a firm footing. As a general physician, Dr Ashok Mishra is well versed in several related fields from where he easily draws references in order to make the correct diagnosis and recommend the correct form and route of treatment. He has completed his MBBS from the very prestigious Allahabad University in the year 1975. With 41 precious years of experience behind him, this well qualified and well experienced doctor helps in putting families at ease by creating a relaxed environment within which they can easily discuss symptoms and problems pertaining to the ailments and risks that they may be facing. He is also involved directly in a number of treatment methods with which he can help patients suffering from weight issues, aging problems, infertility and even problems pertaining to substance abuse. He offers treatments like oxygen therapy, smoking cessation therapy and detoxification, surrogacy planning and treatment, weight management for patients who are underweight or overweight, as well as those who are at risk of contracting diabetes and other such lifestyle diseases due to obesity. Besides this, he also carries out allergy tests and helps in managing pre and post natal care for pregnant ladies. With these kind of treatment methods, he is also known as one of the most versatile general physicians in Allahabad. He is fluent in both Hindi and English.